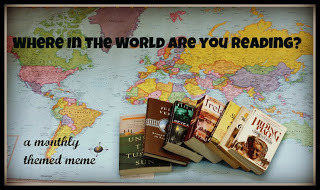 If you aren't familiar with Where in the World Are You Reading yet, please check out the meme page with all of the monthly prompts. This months topic is 'Reading Companion'. You can interpret that any way you wish. I have a few animals, but not all of them are reading companions. 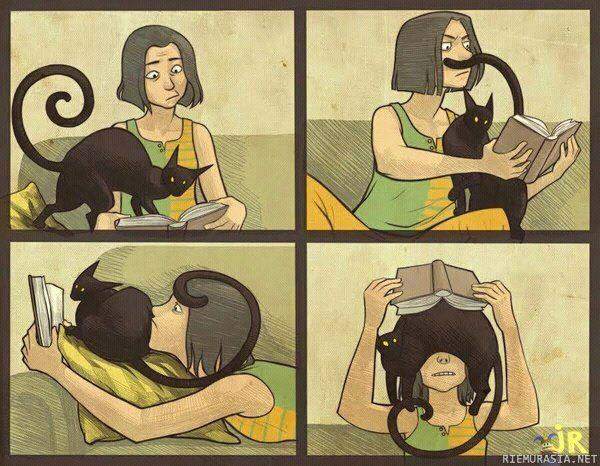 My cat Malz is the #1 reading companion - he always crawls up on the bed with me when I'm reading. Sadly he tries to lay on the book much of the time, or my chest, or my arm, or my FACE. As annoying (but cute) as he is, when he's not laying on me in bed reading, he likes cuddling with me in the living room chair. Sometimes he comes with me to read on the porch also, although typically when I read on the porch I let me rabbit Kirby out to stretch his legs. I thought about taking cute pictures with the animals and books, but basically I'm too lazy to do that. Also, they likely won't cooperate, so we'll just have to deal with what we already have. Here is a picture I have with Malz and books. 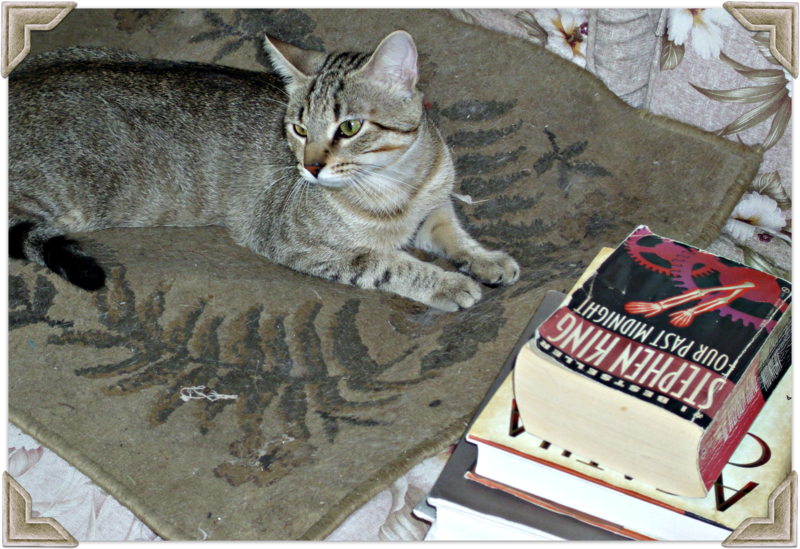 I was trying to get a cute shot of him with some books for an older Mailbox Monday post. Didn't work out quite as well as I hoped. 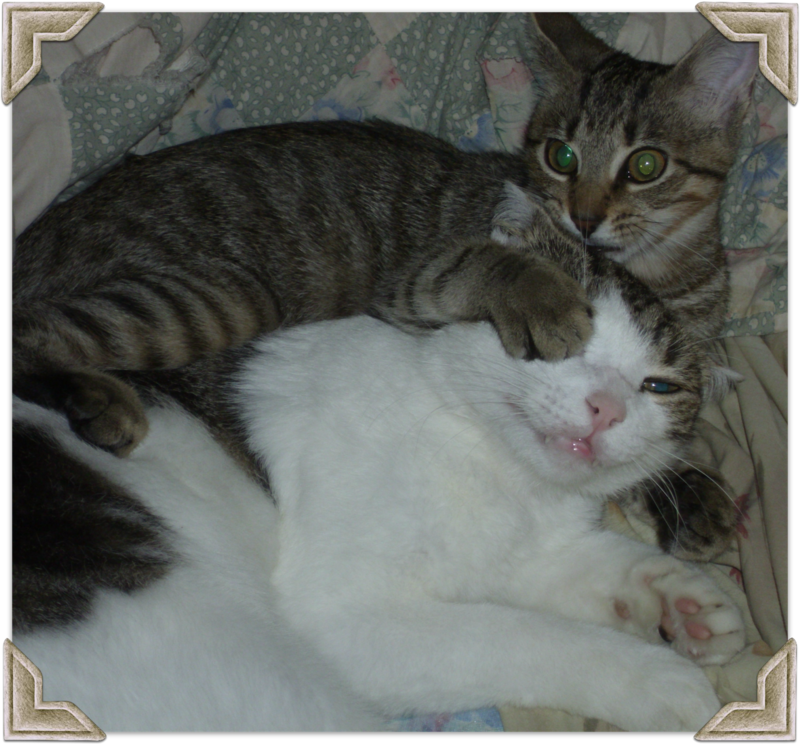 I really need to get some better animal book pictures in the future. It should be evident right away why reading with Kirby the lop will not work well. 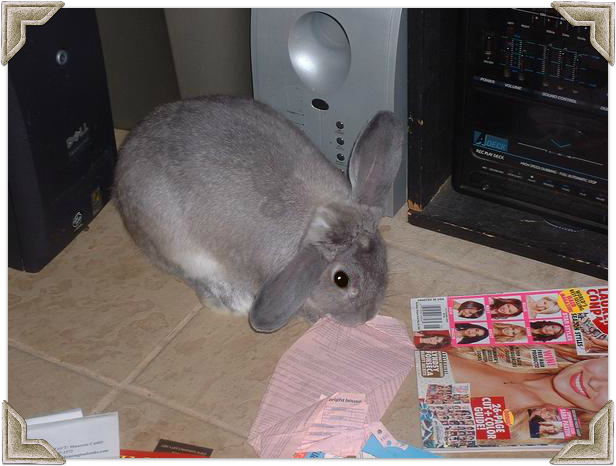 The rabbit would want to spontaneously chew the book. Bunnies love paper....too well. When I read outside with him on the porch, he hops around while the book and me are safely on the chair. As a funny story, in my old house I had a bookshelf to make a little wall in the hallway. The bedroom door had been removed so when the bookshelf was propped up, it created a little room and further space. 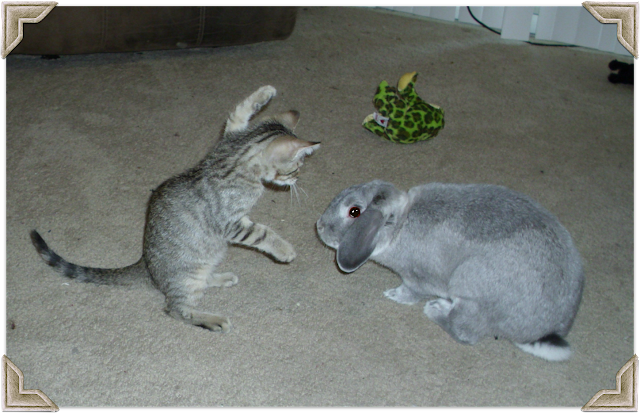 The rabbit delighted in running up to the bottom of the bookshelf, grabbing books to throw them off, and then making himself a hole to hop through to get to the next room. This isn't to say Malz is innocent all the time with book vandalism, though. He has been known to conspire with Kirby to wreck havok on my books (See: Are our animals really out to get our books?) and evidence of damage he did all by himself in a previous Mailbox Monday & When Cats Attack post. Thankfully this phase had ended. This picture of Corn is fuzzy since it was taken with a camera phone. She doesn't ever lay with me when I'm reading, so she's not really a book buddy. 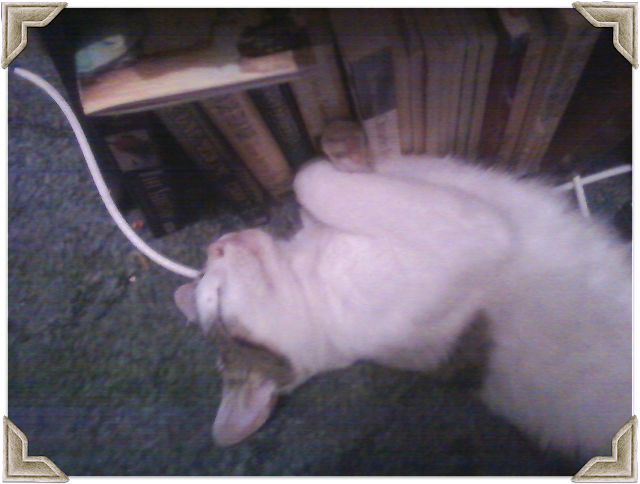 Still, I took a few cute shots of her cuddling in the little book room near the books. That about covers it for the reading buddies. I do have my fiance, Nathan, who also reads in bed sometimes while I do. Don't think I have a picture of us together reading though.